This beautifully designed, gated residential development provides the privacy of single family homes with the convenience and amenities of condominium living. Eastbrooke’s lush landscaping offers a tranquil escape for its residents, filled with soaring trees, and an array of flowers and greenery. The development includes 76 townhomes and approximately 150 residents. 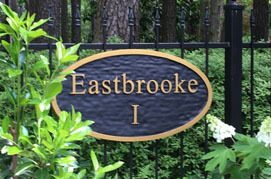 Eastbrooke I amenities include a clubhouse and pool, guest parking, and a gated entrance. Eastbrooke I is located in the capital city of Jackson, Mississippi. It is conveniently located on Lakeland Drive, just east of Interstate 55, very near the best medical facilities in the state, and some of the best shopping, dining and entertainment that Jackson has to offer. With Jackson International Airport only 15 minutes away, you have easy access to destinations throughout the world on major carriers. A city park within walking distance provides a vast green area for picnics and dog walks. The Eastbrooke I Homeowners Association is professionally managed by Ridgway Lane and Associates, 10 Canebrake, Flowood, Mississippi, 39232, (601) 936-9910. Association homeowners can login to access a variety of useful information, resources, and tools to help connect association families and keep them up-to-date. A new and complete Homeowners' Directory will be posted soon. An updated notice of rules and regulations for Eastbrooke I owners has been posted on the Our Association home page. Please scroll down the page to read and review these reminders.